Kandice Cota, known as the "Voice of Color", is an emerging California artist whose works are now collected worldwide from London to China to Australia. She is a mixed media, figurative and representational painter. Kandice has used a very specific technique with Via Asia to create the rich look of a classical Asian antique with an American appeal. She hand selects the perfect birch, perfected hardwoods with her husband Robert Cota so that he can handcraft the perfect wood surface for her to paint. First she does an under-painting with the rich dark coat in a particular design on the wood. She then overlays a very oiled down base of beautiful color to create the light effect. She then layers in several other colors and mediums to develop a depth within the space while further defining it with fiber, fabric and design elements to create a world that describes a particular character. 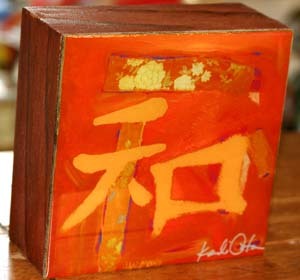 Kandice's Via Asia Series was originally inspired early on in her life when she studied Chinese character and bamboo painting while living in Asia. In doing mixed media, she was inspired by the process of freedom and as she applied the color, fabric and texture she let is speak to her via Asia. She then chose the Chinese character to best describe what she felt. Each piece describes a beautiful and vibrant emotion, inspiration or affirmation about the passion of living and Kandice's own pursuit of dreams and happiness. Each piece is produced as flat panel on wood with a polymer coating. The Via Asia Series has been so well received that the designs have been expanded to childrens, womens and mens clothing and throws, some of which are also offered here. Love Is Forever - part of the Via Asia series by artist Kandice Cota. 6 x 6 this picture can stand or be hung. 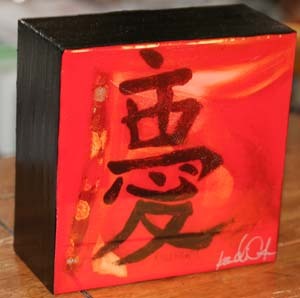 Home of Tranquility - part of the Via Asia series by artist Kandice Cota. 6 x 6 this picture can stand or be hung. 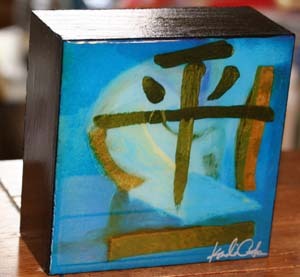 Celebrate Life - part of the Via Asia series by artist Kandice Cota. 6 x 6 this picture can stand or be hung. 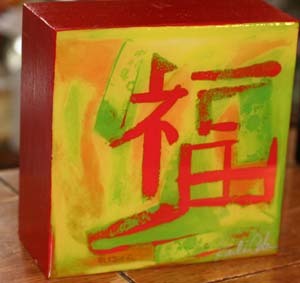 Luck for Health - part of the Via Asia series by artist Kandice Cota. 6 x 6 this picture can stand or be hung. 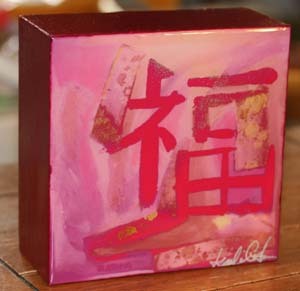 Luck for Creativity - part of the Via Asia series by artist Kandice Cota. 6 x 6 this picture can stand or be hung. 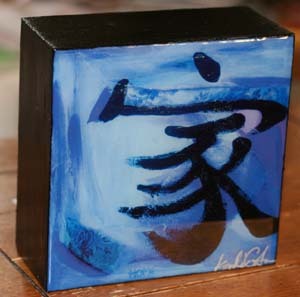 Peace In Ocean - part of the Via Asia series by artist Kandice Cota. 6 x 6 this picture can stand or be hung. 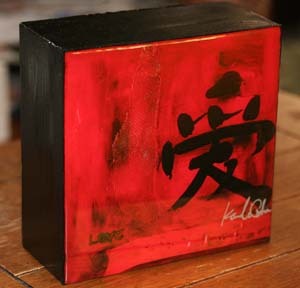 Zen Harmony - part of the Via Asia series by artist Kandice Cota. 6 x 6 this picture can stand or be hung.